Gold and Black - are the colours of Central as harvest time approaches, with the black nets and ripening grapes of the vineyard in stark contrast to the gold of the hills behind it. 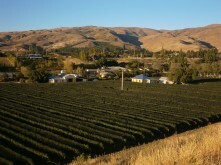 Bannockburn - the "heart of the desert" has long been associated with gold - from the gold mining days of the past to the gold medal wines of today. The grapes at Domain Road are looking great and harvest is about to begin - the first step on the way to another gold we hope for our Pinot Noir - something we have achieved consistently since our first vintage in 2006. Black and gold - a winning combination!